Batteries are essential components for electric vehicles (EVs) and the systems that store more energy allow for a longer EV driving range. Batteries also have the potential to provide service for the electric power grid, where large-scale energy storage is needed to stabilize the grid and enable increased integration of intermittent renewable power generation. While some batteries, such as lithium (Li)-ion, can be used in vehicles and on the electric grid, a major challenge in both applications is the cost of the battery system, and its associated lifetime. The design of today’s cells and the process to manufacture them adds substantial size and cost. To make lithium ion cells today, substantial capital investment is required for specialized coating lines and related facilities for processing the cells. New material formulations provide the opportunity to create modified cell designs that deliver higher performance and can be manufactured less expensively. The slurry allows the delivery of the active Li material in the form of a film of closely packed particles in the form of a semi-solid flow. The material delivered covers the current collector completely, and allows thicker films without the cracking and poor adhesion of traditional manufacturing processes. The use of a single thick film greatly simplifies design and fabrication compared with alternating thin films of anode and cathode materials used in traditional cells, as shown in Figure 1. The new cells have an additional advantage of higher energy density than state-of-the-art large format Li-ion cells because they allow a larger ratio of active material to inactive material. The 24M team demonstrated a low-cost, scalable fabrication process, in which they mixed the solution, extruded it onto a current collector, and assembled the cell by pressing components together and sealing the cell assembly. The team concluded their ARPA-E project with the successful delivery of a 17Wh cell that used thick electrodes (more than 400 µm) with high loading of active materials (more than 40% vol), cycled at high efficiency (more than 85% roundtrip), and showed reasonable cycle life (more than 1000 cycles) with limited capacity loss. 24M has designed the cell to operate at a continuous charge/discharge rate of C/4, and have also shown good performance in grid duty cycles with sustained power pulses of up to 2C. 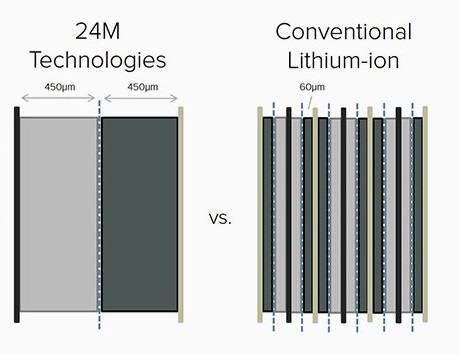 Figure 1: A 24M battery cell is shown on the left side of the diagram, and a stack of conventional lithium ion cells on the right. The 24M cell has two thick (450um) electrodes: a graphite anode (shown in light gray) and a lithium iron phosphate (LFP) cathode (shown in dark gray). The dotted blue line shows a polymer cell separator, and the thin lines on the outside of the cell show the cell current collectors (Cu for the anode, and Al for the cathode). In contrast, six conventional lithium ion cells are shown on the right of the diagram. These cells have much thinner electrodes (60um), but employ separators, and current collectors that are similar to the 24M cell. As a result, more inactive components (separator and current collectors) are used within the same cell volume, adding cost and potentially reducing energy density. The company has obtained continuing support from venture and strategic investors to continue development of its technology. The research team has developed an automated cell fabrication process, and continued to enhance the performance of its cells, including extending cycle life and increasing active material loading. By driving down costs and improving performance, 24M’s new cell promises to be very competitive compared with the incumbent Li-ion technology and its projected improvements. 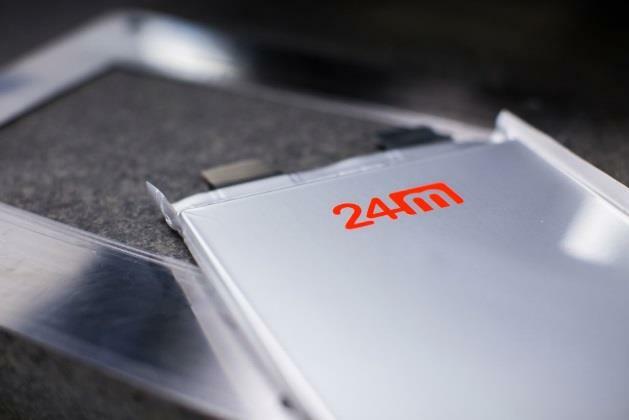 24M is targeting its thick-film batteries for providing grid services with intermediate power and energy requirements (~4 hour duration), such as peaker replacement systems, grid asset optimization, and renewable energy time shift. The company is developing strategic partnerships aiming to bring their product into volume production by 2018. Figure 2: Photo of a 40Ah, 300 sq. cm (130Wh) lithium ion pouch cell manufactured by 24M. From the exterior, this looks like a conventional lithium ion cell, but it was manufactured using 24M’s unique low-cost process. The future electric power grid will require energy storage that not only enables the integration of increasing amounts of renewables, but also improves the grid’s operating capabilities, enhances reliability, allows deferral of infrastructure investments and provides backup power during emergencies. The advances that 24M has developed in lower-cost manufacturing and battery design offer a significant new pathway to meeting the cost and performance requirements needed for wide-scale adoption of battery systems for grid-scale services, which include battery pack costs of $100/kWh or less with a cycle life of more than 5,000 cycles. Bae, et. al. (2013). Design of Battery Electrodes with Dual-Scale Porosity to Minimize Tortuosity and Maximize Performance” Advanced Materials, volume 25(9), p. 1254–1258. Brunini, et. al. (2012). Modeling the hydrodynamic and electrochemical efficiency of semi-solid flow batteries. Electrochimica Acta., volume 69, p. 301-307. Duduta, M., et. al. (2011). Semi-Solid Lithium Rechargeable Flow Battery. Advanced Energy Materials, volume 1(4, July) p. 511–516. Smith, et. al. (2014). Maximizing energetic efficiency in flow batteries utilizing non-Newtonian fluids” Journal of The Electrochemical Society, volume 161(4), p. A486-A496.